When Zaman decided to open his restaurant he had a vision of creating something that was distinctly different from traditional Indian restaurants. He chose to locate his restaurant in the charming Buckinghamshire village of Bourn End and in order to create something distinctive he acquired the Heart in Hand, a traditional English Victorian pub, with ample car parking and very attractive gardens. His conversion of the old pub was very sensitively thought through and whilst retaining many of the original features such as the Victorian bar the rest of the pub is a very comfortable fine dining restaurant with many nooks and crannies in which to enjoy superb Indian food in relative privacy. 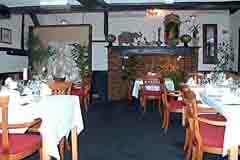 With a very attractive enclosed garden to the rear, the Heart in Hand is a perfect venue for family dining, especially to take advantage of the warm summer weather, and with ample car parking it the ideal destination in which to enjoy the fine Indian food. The first thing you notice on entering the restaurant is the friendly welcome and the very comfortable traditional bar area in which to relax and have a drink whilst you browse the menu or await your take-away. The bar offers a complete range of beers, spirits and soft drinks. The Sunday buffet at the Heart in Hand is a must and is certainly very good value � eat as much as you like for only �6.95 (children �4.95). In order to make your party or special occasion a success the Heart in Hand will provide a complimentary decorated cake for birthdays, anniversaries, engagements etc. Please call and book in advance. The restaurant also offers a home catering service where, for your special party, you can enjoy a fine selection of their dishes in the comfort of your own home, prepared and served by professional staff. Open noon-2.30pm and 5.30pm-11.30pm every day. All major credit cards accepted. No service charge. The menu, which contains many of the more popular dishes, also offers a selection of house specials such as Chicken Korma Badami or the Heart in Hand Chicken or Lamb cooked in a creamy tomato sauce and finished with rum.